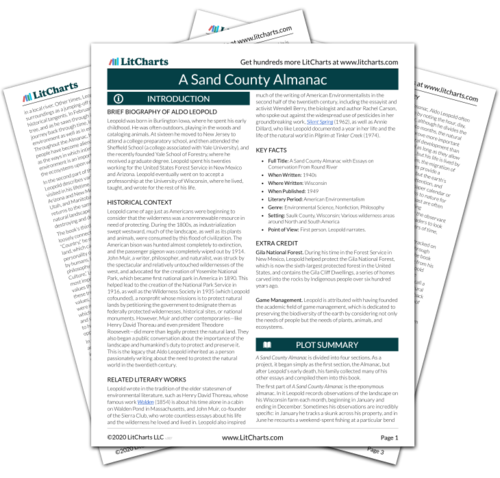 Instant downloads of all 942 LitChart PDFs (including A Sand County Almanac). 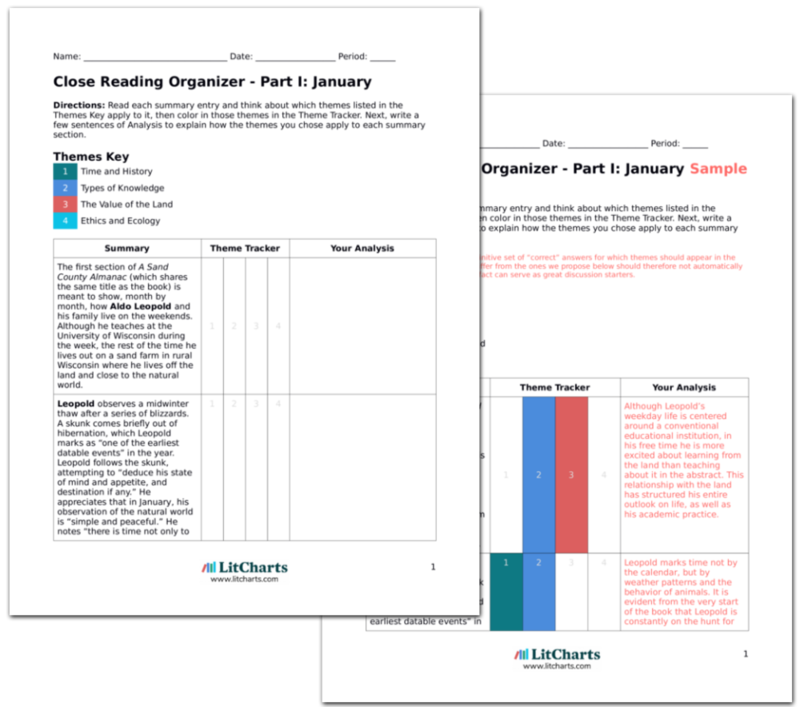 LitCharts assigns a color and icon to each theme in A Sand County Almanac, which you can use to track the themes throughout the work. In April, Leopold meditates on the spring floods that sometimes trap him and his family on their farm. He observes that, as soon as floodwaters rise, the geese arrive searching for food and exploring their “expanding universe.” Meanwhile, terrestrial animals are indifferent to the changes in the land, moving only when they must to stay dry. According to Leopold, different animals only see the natural world in terms of how it affects them. What to one animal is a natural disaster, to another is a welcome flood that expands its habitat. Although for some people, spring floods would be a disaster, Leopold loves getting extra time on his land. The floods bring miscellaneous objects and scraps of wood to Leopold’s yard. In the wood especially, Leopold finds “an anthology of human strivings in upriver farms and forests.” He notes that “the autobiography of an old board is a kind of literature not yet taught on campuses,” but nevertheless finds importance in closely observing the histories of the wooden scraps. Here, Leopold once again finds history written in wood. Instead of February’s oak tree, Leopold now can look at history in driftwood. Though to some this would be trash, to him it is a useful source of knowledge. It isn’t the kind of history he could teach in his college courses, but he nonetheless finds it to be personally valuable. Sitting by the banks of the flooded river, Leopold believes that the solitude created by a spring flood is the most intense kind of aloneness there is. This fills him with glee. Leopold finds value and joy in a moment that for others might be actively frustrating. This helps prove his point that the value of the landscape is often not purely economic. Because he loves the land and pays such close attention to it, Leopold is able to recognize and name many plants the average passerby would not even notice. Although many of these plants are not economically valuable, he believes they are still important members of the biotic community. Leopold catalogues the bur oak, a tree notable for being able to withstand a prairie fire. They have thick, cork-like bark that functions as armor. Leopold imagines the prairie and the forest engaging in a twenty-thousand-year war for territory, in which rabbits ate the prairie, clearing space for trees, and then winter frost killed oak seedlings, and so on. The human settler eventually ended up in the middle of the war. Fires had helped control the growth of forests, but when farmers came along they mowed the prairie, which reduced the fires and allowed the trees to grow unchecked. In addition to the draba, Leopold loves and respects the bur oak. He understands its role in the history of the prairie, and uses the oak tree as a way to mentally travel back in time and imagine life in Wisconsin before European settlers irrevocably changed the landscape. Back then, the land regulated itself, and although there was constant tension, there was also a sustainable balance. Although not a conventional historical text, the oak tree contains history within it whether it is being cut down to expose its rings, or whether it is being used as a way to imagine a distant, wilder past. Leopold enjoys a performance that he calls the “sky dance.” The sky dance is a nightly dance by a male woodcock, who performs in the spring as the suns sets and early in the morning as the sun rises. Leopold finds the sky dance mysterious, but enjoys the mystery, wondering how the female woodcock is incorporated, and whether the ritual is a mating ritual. Leopold finds value in many aspects of the landscape. The sky dance especially brings him joy, and though he doesn’t understand it entirely that does not make him value it any less. Leopold readily criticizes farmers who, for whatever reason, are not in tune enough with the land to notice the wonderful performances taking place on it. Although this kind of observation does not require a kind of conventional education, it does require a special kind of observational skill and purpose that many do not seem to possess, and seems inversely related to the “progress” and industrialization of a slice of society. Leopold sees the woodcock as a symbol of the grand utility of birds beyond their use as hunting targets. He still enjoys hunting them, but finds that because he so enjoys their dance in the springtime that he is more moderate in his killing. While a dead woodcock’s economic value can be fairly easily gauged (how much would it sell for, how much would a similar game bird cost), Leopold finds it to be valuable year-round. Its dance, although harder to quantify, brings him equal or greater pleasure than the taste of its meat. Sanders-Schneider, Ivy. "A Sand County Almanac Part I: April." LitCharts. LitCharts LLC, 27 Mar 2018. Web. 19 Apr 2019. Sanders-Schneider, Ivy. "A Sand County Almanac Part I: April." LitCharts LLC, March 27, 2018. 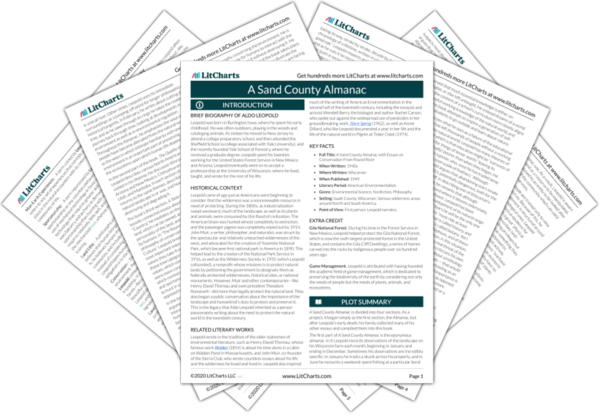 Retrieved April 19, 2019. https://www.litcharts.com/lit/a-sand-county-almanac/part-i-april.